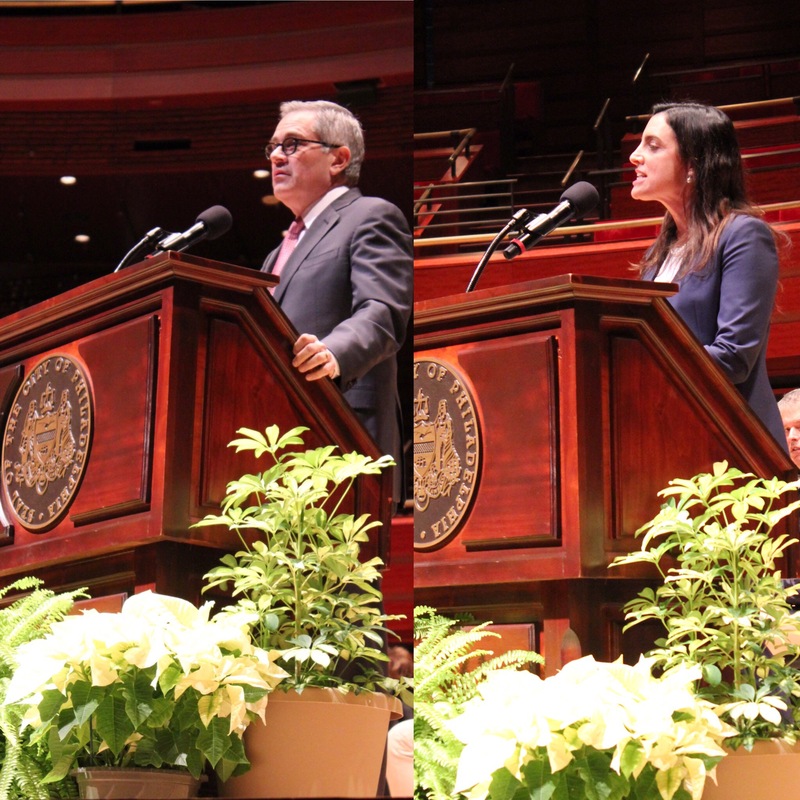 Yesterday morning in front of an enthusiastic crowd in Center City, Rebecca Rhynhart and Larry Krasner were sworn in as City Controller and as District Attorney. Both candidates won unexpected primary victories against more conventional opponents. Rhynhart, who was sworn in first, says she has dedicated herself to ushering in an era of transparency in the Controller’s office. Rhynhart offered specific policy proposals to implement her position, outlining a few of the ways that she intends to push for the reallocation of the city’s budget in order to better suit its citizens’ wants and needs. Speaking of the city’s behavioral health budget, Rhynhart announced that “a performance audit needs to be done of this at a time the opioid epidemic is raging, at a time the trauma from gun violence is felt across our neighborhoods, we need to be using this money in the best way possible”. Met with cheers from her audience, Rhynhart also asserted that “it is unbelievable that the Parking Authority has such horrible financial management and waste when our schools need every dollar”, vowing to ensure that the PPA enforces the suggestions set forth by State Auditor General DePasquale, and to work side-by-side with him. As an example, Rhynhart mentioned that “one of the payments that the Police Department made was publicized a few weeks ago and it was a few million dollars.” The Declaration first reported the harassment settlement paid to former detective Michele Vandegrift. Immediately after Philadelphia gained a new City Controller, it swore in a new District Attorney, lifelong civil rights lawyer Larry Krasner. Krasner was sworn in by his wife, Judge Lisa Millett Rau. Introduced by a vivacious string of gospel songs, preachers, and introductory speeches, Krasner was the main attraction at the Kimmel Center on Tuesday. Audience members leapt to their feet at mention of his name, applauded his presence, and some even shed tears. “In the City of Brotherly Love and Sisterly Affection, we are all family”, Krasner informed the crowd, met with cheers, as he dove into the heart of his speech. In contrast to Rhynhart’s concrete proposals, Krasner employed a series of emotional anecdotes, promising at the end of one story that “today we start the long road toward trading jail cells occupied by people suffering from addiction for treatment, for harm reduction”. Despite detailed activist demands for changes in his first one hundred days in office, Krasner remained tight-lipped concerning his plans for his time in office, declining to detail his agenda or to name his appointments for top-level posts, such as his First Assistant. In a post-ceremonial press conference, Krasner was asked to whether he plans to end cash bail shortly after entering office in accordance with activist demands. He stated that “we intend to move towards a situation where there is no issue of cash” but did not provide a timeline. As The Declaration previously reported, some of Krasner’s campaign promises, such as cash bail, are not fully within his control and may not be able to be implemented within his first one hundred days. When asked whom he will be appointing to key positions in his office, Krasner stated that he will make those announcements within the next few weeks. Please donate to The Declaration to support more investigative journalism like this. You can make a recurring donation with Patreon or make a one-time donation with PayPal.